Over 250,000 non-homeowners appear to have given up on the dream of homeownership in the past year alone, according to the 2017 Homeowners Survey, an annual study conducted by the HomeOwners Alliance and BLP Insurance into the concerns, views and issues affecting British homeowners and aspiring homeowners. 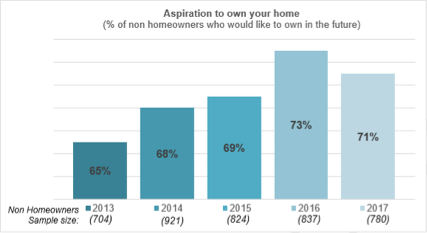 The study found that for the first time in five years, there has been a drop in the number of non-homeowners who aspire to own. In 2013, 65% of non-homeowners aspired to homeownership, with this number increasing every year and peaking at 73% in 2016. But this year, the numbers have fallen for the first time, back to 71%. This equates to around 253,166 people across the country who have given up on ownership in the past 12 months. The stats mirror the rise of the government’s flagship Help to Buy programme launched in 2013 and is now receding with the cancellation of the mortgage guarantee part of the scheme in 2016. Five years on from the first Homeowners Survey, aspiring homeowners’ concerns about house prices, saving for a deposit and availability of homes are the biggest issues and are worsening with time. Among aspiring first-time buyers, 86% say house prices are their most serious concern (up 3% in the past year), with 85% citing saving for a deposit as a serious problem (up 1%) and 80% worried about the availability of homes (up 2%). The findings also reveal a deepening housing crisis, with concerns rising in nearly all areas of the country. London is suffering acutely, but the problems are not contained to the capital. While Londoners are the most concerned with house prices (87% saying that they are a problem), this is also echoed in Wales (87%) and the East of England (85%). Similarly, availability of housing is a concern for Londoners (81%) but slightly more people in the South West (82%) also stated that it was an issue in their region. Elsewhere in the country, concerns were about being able to re-pay a mortgage, particularly in Yorkshire & Humber (68%) and Northern Ireland (68%). Across the country, the number one concern among Britons remains the difficulty of getting on the property ladder in the first place. This was seen as even more of a problem this year (86% saying that it was a problem or serious problem) than last year (82%). While average earnings have increased 2.6% annually, average property price growth over the same period of 4.5% has out-paced this. “The HomeOwners Alliance has been tracking views of consumers for five years now, and these latest findings show that the housing crisis is deepening across the UK. This in turn is impacting on people’s aspirations to get on the property ladder. While we are used to stories about people not being able to buy a home until they are 40, the story has taken a turn for the worse with people increasingly giving up altogether on the dream of homeownership. While aspiring homeowners’ concerns about house prices, saving for a deposit and housing supply grow, the change in political rhetoric around homeownership and a lack of new homes being built in the last year, plus the removal of flagship government schemes like the Help to Buy mortgage guarantee, appear to have had a negative impact on consumer attitudes. People are feeling less optimistic about their chances of buying their first property. Commenting on the figures, Kim Vernau, Chief Executive Officer of BLP Insurance said: “The housing crisis is worsening across the country. We are failing to deliver the numbers of homes required as a direct result of a lack of SMEs to develop over and above the numbers provided by the large house builders. The recent housing white paper from the Government proposes a wide variety of recommendations to the market for consultation, to address issues with planning and resource, with a distinct shift away from focusing solely on home ownership. This is a tacit acknowledgment that not everyone will be able to own their home. There is some good news. Concerns are receding on issues such as negative equity and the ability to move up the housing ladder. Some 42% of UK adults say they are concerned about negative equity, compared to 44% last year, 49% in 2016 and 64% in 2014; after a steady increase in house prices. Alongside this, concern about the ability to move up the ladder has softened, down 4% in the past year to 58% (compared to 65% in 2014). I believe this trend will continue; so many unsuspecting first time buyers of new homes (often through government backed help to buy schemes) have been fleeced with leasehold houses saddled with onerous ground rents and unfair lease terms, meaning their homes are essentially unsaleable. This widespread sharp practice by house builders and property investors is now becoming common knowledge, and I think it has already done huge damage to people’s perception of the purchase of their own home as being a safe long term investment for their savings, as well as somewhere to live.